The cover art of "Brotherhood Of The Snake", the twelfth album from San Francisco Bay Area thrash metal veterans TESTAMENT, can be seen below. The CD will be released on October 28 via Nuclear Blast. 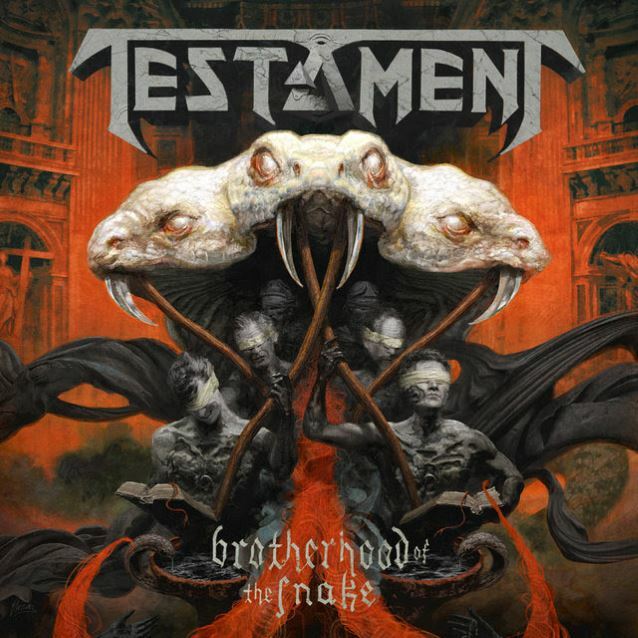 The cover was once again created by renowned artist Eliran Kantor, who also handled the art for the TESTAMENT's last album, 2012's "Dark Roots Of Earth", and also worked with bands like HATEBREED, SOULFLY and KATAKLYSM in the past. "Brotherhood Of The Snake" was recorded under the watchful eyes of producer Juan Urteaga (EXODUS, HEATHEN, MACHINE HEAD), guitarist Eric Peterson and singer Chuck Billy and was mixed and mastered by British metal producer Andy Sneap (ACCEPT, ARCH ENEMY, CRADLE OF FILTH, KREATOR, MACHINE HEAD, MEGADETH). Peterson told Kaaos TV about "Brotherhood Of The Snake": "The only difference on this one is we're trying to be a little bit more organic, and getting away from Andy's perfection sound, and get more of a looser… you know, still keeping the slickness of it, but trying to get a little bit more raw. So it's kind of a hard way to describe it. But we don't want it too perfect. And I didn't record four guitars; I did two this time. So there's a lot more air going on with the rhythms and stuff like that." Asked whether the musical direction of TESTAMENT's new material is a throwback to the band's early albums or if it's more similar to the recent TESTAMENT records, Eric said: "More like the modern [TESTAMENT sound], but, you know, like I was saying earlier, having that more raw feeling. Of course, our influences have changed a lot. For me, I always get accused of listening to older stuff [and I am told that] I need to listen to more new stuff. But I always like to go back and listen to records from the '70s and the '80s. And I won't name the bands I listen to, but I listen to a lot of different stuff that has nothing to do with metal, because I hear things differently. I don't hear it, like… You know, like if I listen to [American blues rock guitarist] Joe Bonamassa or something, I'm not, like, 'Wow, I wanna sound like that.' I just kind of get ideas of key changes and the way he hits certain notes or whatever and apply it to what we're doing. And that's the same thing with anything." TESTAMENT will promote "Brotherhood Of The Snake" by teaming up with AMON AMARTH for a European tour this fall.